Usually people ask me to help them to decide which car to buy, and sometimes the cars they are considering aren’t similar at all. Justin from California is torn between taking his Volkswagen diesel buyout and getting another car—or a plane. The answer is not as simple as you think. I am one of about 400k people who will soon be turning in their VW Diesel pollution mobiles (2012 VW Golf TDI, manual) and that will leave me with a few extra dollars in my pocket. So here is my situation: I am active duty military and I travel a lot for work, hence the diesel VW, but I am also a pilot and currently belong to a flying club. Now my wife has a 2006 Honda Odyssey minivan that we bought brand new and it is approaching 200k miles. One way or another she is getting a new minivan and we will finance it. That leaves my money from my VW buyback for me. I’m thinking one of two ways. 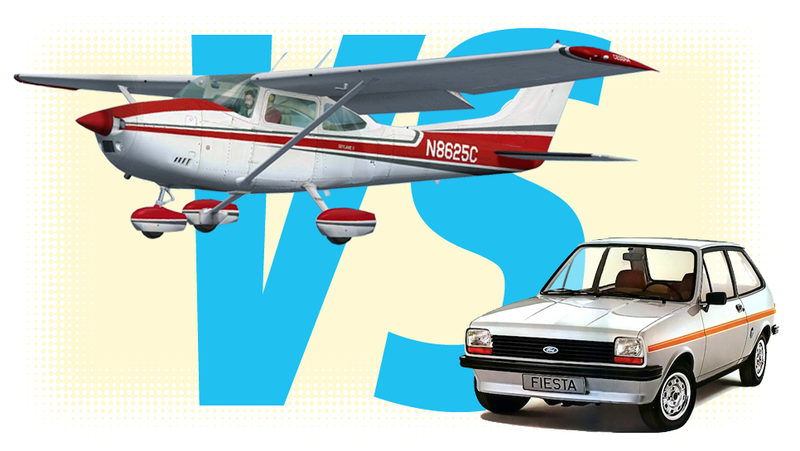 Option one, buy another reasonable car or truck and use that or (2) take my wife’s old minivan (after I buy her another) and then buy myself an airplane similar to a Cessna 172 or Grumman Tiger both of which would be in the $25 - 30k range. I have an airport within 10 miles of my house and tie downs at the field cost $73 per month. Now hear me out. So I would be stuck driving a minivan, not so great, but I would also have an airplane....super great! In addition, I have a Harley Road King and an ‘83 CJ-7 that I recently blew the head gasket on but I plan on fixing it in the next month or two. I live in Southern California where the weather for both riding and flying are excellent. So let’s examine the options based on some calculations. We will assume that you will be able to buy a plane with cash given your buyout, or you could buy a car with the same cash. Thirty grand can get you a really nice car, anything from a brand new hot hatchback or a lightly used luxury car with plenty of warranty left. When calculating the cost of a small aircraft I referenced this Investopedia article on the Economics of Owning a Small Plane. Insuring a small aircraft is about $1,200-$2,000 a year. That’s pretty close to the average cost on a comprehensive auto insurance policy, so we’ll call that a wash.
You say that a local airfield has a tie down cost for $73 per month for a total of $876 a year. I imagine you have driveway or a garage for the car that would not cost you anything to park it. You will also have to pay for inspections on the aircraft which run on average about $600 for your basic planes. Obviously, the car needs to be inspected too, but the DMV will typically do that for free. In terms of keeping it compliant and storing it, the car takes the win on this one. Then there’s the fuel costs. Unless you get some kind of giant truck, it’s probably safe to say that you will average at least 25 MPG. If you drove about 12,000 miles a year, your yearly cost would run $960, based cost of regular fuel in California at about $2 a gallon. If you get a sporty car that required premium, that brings it up to$1,152 a year, based on the current cost at $2.40 a gallon. It looks like aircraft fuel currently hovers around $5 a gallon and most small aircraft burn between five and 10 gallons of fuel per hour. In order to make that aircraft purchase worthwhile, I assume each flight would be a minimum of six hours. If we use an average of eight gallons an hour, that works out to about $240 per flight for fuel. If you used your aircraft once a week, you are looking at a yearly fuel cost of about $12,480. If only were able to fly on a bi-weekly basis, it would run you about $6,240 a year. Even if you use premium fuel in your car, your are still keeping over five grand in your pocket compared to the plane. Now it’s time to examine the intangibles, such as the operating experience. I’ve never flown a plane but I imagine it’s pretty awesome. I have driven some fairly awesome cars, but it would be difficult to replicate the thrill of piloting an aircraft for thirty grand. Now if you had $300,000 that’s a different story, but if you had that kind of money for a car you could afford both. The fun factor per dollar ratio goes to the plane in this category. I think what it comes down to is whether the fun factor of that aircraft is worth an additional $6,500 a year for a vehicle that you are only using for 156 hours, or an additional $12,500 if you are flying for 312 hours a year. Compare that to a car that if you drove an hour a day, five days a week that works out to 1,300 hours. Let’s say 300 of those hours you are on either your motorcycle or your classic Jeep—do you really want to spend 1000 hours a year behind the wheel of a beater minivan only to get a few hours of glory on the weekends? It seems to me that if there was an option to get a nice $20,000 car and rent an aircraft on occasion for about $10,000 a year, that would be the best of both worlds.